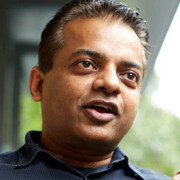 Pankaj Aggarwal is an associate professor of marketing at the University of Toronto. He received his Ph.D. from the Graduate School of Business, University of Chicago in 2002 and his doctoral dissertation on consumer-brand relationships won the Marketing Science Institute’s Alden G. Clayton Award for best dissertation in 2000. His primary research interest is in studying ‘brands-as-people’, specifically conducting research on consumer-brand relationships and brand anthropomorphism. He also studies issues related to culture, time, and money. His research has been published in leading marketing and psychology journals such as the Journal of Consumer Research, Journal of Marketing Research, Psychological Science, and Journal of Consumer Psychology, and he serves on the editorial boards of the Journal of Consumer Research and the Journal of Consumer Psychology. Prior to entering academia, he was Vice President at J. Walter Thompson Advertising, heading its New Delhi office. Aggarwal, Pankaj and Min Zhao (in print), “Seeing the Big Picture: The Effect of Height on the Level of Construal,” Journal of Marketing Research, in press. First published online July 7, 2014.